Matthew holds a Master of Music with Honors in Cello Performance from the Boston Conservatory and an undergraduate degree in Music Performance from the Pennsylvania State University. 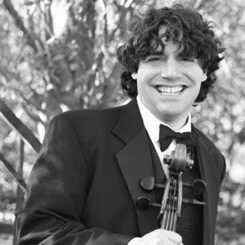 Matthew has logged over 15 years playing experience on the violin and viola. He has performed with various orchestras such as The Springfield Symphony Orchestra, Glens Falls Symphony, Massachusetts Symphony, Thayer Symphony, Symphony by the Sea, Lexington Sinfonietta, Bangor Symphony, and the Vermont Symphony. He has been a member of the Grammy Award winning Albany Symphony (ASO) since 1998. The ASO is the nation's leading orchestra for performing and recording contemporary American symphonic music. They made their Carnegie Hall debut in May 2011. With the ASO, he has shared the stage with world renowned soloists Yo Yo Ma, Joshua Bell, Itzhak Perlman, and Emmanuel Ax. Matthew has performed with the Trans-Siberian Orchestra, the Mannheim Steamroller, Peter Gabriel, Dennis DeYoung, Josh Groban, Sarah Brightman, and David Gates. He teaches strings at Music & Arts in Westborough, MA, and in the surrounding areas. His educational philosophy includes, "Anyone can learn with regular practice and listening. If you can speak one language, you can learn to sing or play an instrument."